If you are looking for a cheap hearing amplifier the Britzgo BHA-220 digital could be worth a try. It seems to get the balance between affordability and usability about right. If you are ready to buy click the button below to purchase direct from Amazon. Or, if you prefer, read on to learn more about what actual users of this device think. Below is a summary of the hundreds of reviews and answers to common questions that we have found during our research. Who are Britzgo hearing amplifiers designed for? Like all amplifiers, this device is not going to work for those who really need medically prescribed hearing aids. If you have very little hearing ability left this style of device will not help you at all. That is why we always encourage our readers to see a doctor initially. It is the best way to get a proper diagnosis and, more importantly, make sure that an underlying disease is not causing your hearing to fade. If you are on a very tight budget and know you do not need a medical-grade hearing aid, this device is definitely worth trying. For many it is an affordable, if not perfect way, to enhance your hearing at least a bit. During our research, we noticed that quite a few people who owned far more expensive hearing aids and amplifiers had opted to buy a set of these too. They used them as spares especially when doing highly active things like running or digging the garden. In these circumstances, in hear and over-ear devices can easily fall out and be lost. The last thing you need is to lose something that costs several hundred or thousands. Instead, people put these cheaper ones in. After all, if they fall out and get lost they are relatively cheap to replace. How much is a Britzgo hearing device going to cost me? The good news is that these hearing amplifiers are really affordable. You could buy four of them for the price you would pay for other behind-the-ear amplifiers. 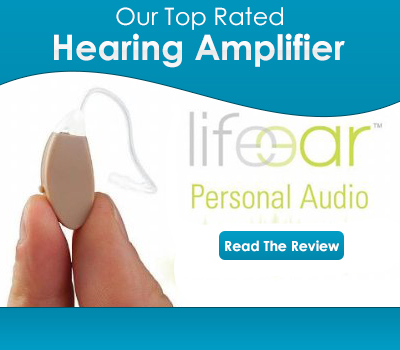 However, when you read the reviews for hearing amplifiers you soon realize that, to a large extent, you get what you pay for. Opinions on this varied, but there were lots of people that said that this device enhanced all sounds evenly. This meant that background noise was too intrusive. There are four settings that are supposed to get around this issue. But, not everyone noticed enough of a difference between each of them to make the listening experience comfortable enough. Given the fact that this is a very basic device, this is not really a surprise. However, there were a few people who said it was not an issue for them. Again, when it comes to screeching and feedback, the reviews are mixed. Poorly fitted devices make this issue more likely. So, there is a possibility that some of these people were having problems simply because they were not using the right size tips. However, others clearly knew what they were doing and could not eliminate the feedback. Some users were happy to put up with this issue because it only really caused them problems in very noisy environments. Can you wear it while making a phone call? Users experience of making a phone call while wearing this device varies. For most the best approach is to put the phone on speaker and turn the volume right up. This is because putting the phone to the ear can create feedback between the two devices. These amplifiers are not as small as some on the market, but they seem to be quite comfortable nonetheless. Included in the kit are three different sets of ear tips. Plus, on the manufacturer´s website, you can buy several different lengths of ear tubes. So, with a bit of patience and a small amount of cash you can customize these to fit better. However, if you have very small ear canals you may find that they keep falling out. All Britzgo hearing products are designed to be used in either ear. They can also be used as a pair. This device is advertised as having 500-hours of battery usage. To us, this seemed unlikely, but a lot of users say they really do last that long. A real plus given how hard and fiddly it is to change the batteries in these little devices. For someone with arthritis or the shakes not having to change the batteries every week is a big plus. Does Britzgo offer a good level of support? Britzgo does have a support desk. On their website, there is a fairly good FAQ page, but they do not appear to be very active when it comes to responding to customer questions on sites like Amazon. They appear to only answer the odd one. However, to put things in context, over just a few years customers have asked hundreds of questions. So, keeping up with that flow rate cannot be easy. The firm that makes these Britzgo devices states that they offer a money back guarantee. However, information about any other warranty does not appear to be available. The advice is to call the manufacturer direct. Can you buy spare Britzgo tubes and tips? You can buy replacement ear tubes and tips and there is a good choice. However, they only appear to be available direct from the manufacturer. Where can I buy Britzgo hearing products? 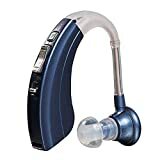 If you want even more information and a place to buy this hearing aid, you can do both on Amazon. It is clear that hundreds of people have bought from there and many of them have shared their experiences. They are also very happy to answer questions about the product. Or, if you want to explore other options, click here to read our full run down of the best hearing amplifiers available today. Do you have a smaller ear insert piece? of them works best for the individual? I have a medium hearing loss in the high ranges—which of the M settings would work best for me?. Have had the device for three weeks now and am getting used to it….but it might be able to do better if I knew how to use it effectively.